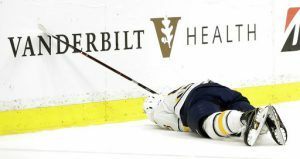 That’s what Nashville’s Scott Hartnell told The Buffalo News after his hit on the Sabres Victor Antipin. That hit caused the defenseman to suffer a concussion, a broken nose, facial lacerations and dental injuries. It’s been 25 years since Hartnell was a young kid. Roughly the early 1990’s. Sports have changed a lot since then, especially when it comes to protecting players. All sports except the NHL. The dinosaurs still roam the rinks of Canada and the U.S. That’s why the hit from the Predators forward did not draw any discipline from the league. They felt the major penalty called in the game was enough. No suspension. No fine. No message to the rest of the league. Just another standard NHL response that the traditions of the game are more important than the people who play it. That’s my problem with all of this. How in any way can a league allow their players to be subjected to these kind of hits and injuries? Especially now, when injuries and plays that lead to injuries are being examined throughout all sports. I point to the NFL. For years now, they have ignored the cries of traditionalists and tough guys and taken out plays that lead to injuries and concussions. Just last week, the NFL deemed illegal any hit that is prompted by a lead with the helmet. Next up may be kickoffs, the most dangerous play in the game. For a while after a progressive rule change, there’s always a cry of the league’s “wussification.” Then, it dies down when players and fans realize the only way to save the game is to do everything possible to make it safer. 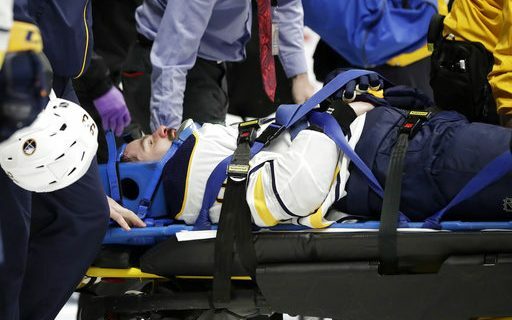 Yet the NHL continues to allow plays that put players at risk for concussions and serious injuries. Their selective enforcement practices are just a silent endorsement of these plays, sending a message to players that they can stand by the tradition of the game when called out for hurting another player. We’ve seen the NFL dramatically change how the game is played to make it safer. I have an idea for the NHL. That’s what should happen. Never should a defenseman like Antipin fear for his safety when retrieving a puck and starting a break-out from his own zone. Never should a defenseman chasing a puck, or an offensive player trying to create an offensive chance, fear that they could go face-first into the glass. Hit a player behind the goal line? Penalty. Automatically. Eventually the players will learn, and the coaches will teach. It will stop happening. Players will be safer. Maybe it will just lead to more offensive chances. Heaven forbid the NHL do something to increase scoring. Because nobody likes watching more offense. What’s the downside? Nothing in my mind. A safer, and more exciting game. If you want to keep plays in the corners, then change the angle of the trapezoid to create a no-hit zone. As long as players can see what’s coming to hit them, I’m fine with that. I’m sure they would be too. Traditions are great in sports. It’s what many of us love about hockey. But let’s be serious. Traditions are no longer a reason to ignore dangerous plays and potential injuries. Not anymore. Not in our world. If the players won’t play safer, then it’s up to the league to force them to change. I don’t blame Scott Hartnell. I blame a league that allows & condones his actions. Victor Antipin’s season is over. Let’s hope he’s the last to hear from a team doctor that the traditions of the game are the reason why. If you agree or disagree with my opinion, please leave a comment below.